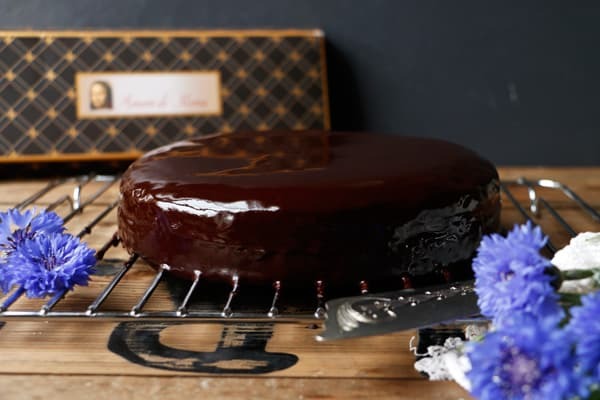 Sachertorte is one of the most famous chocolate cakes in the world invented in Austria in 1832. 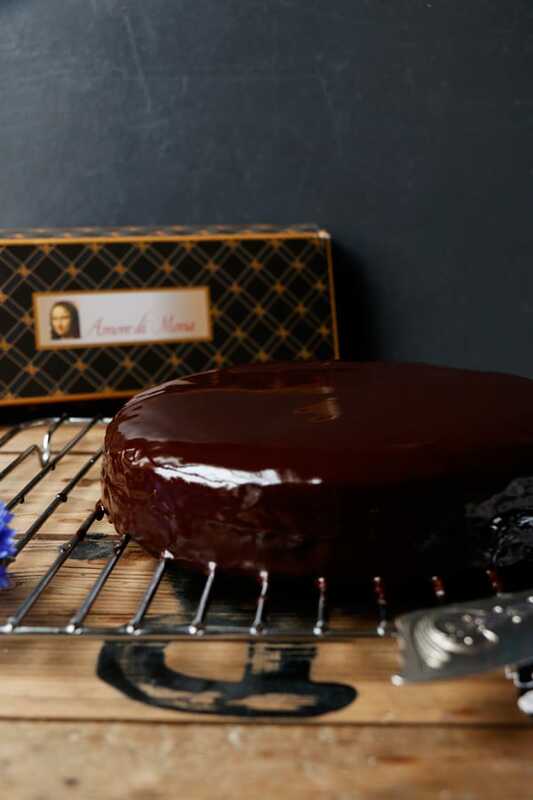 The original Sachertorte is a light chocolate cake filled with apricot jam and covered with chocolate icing. 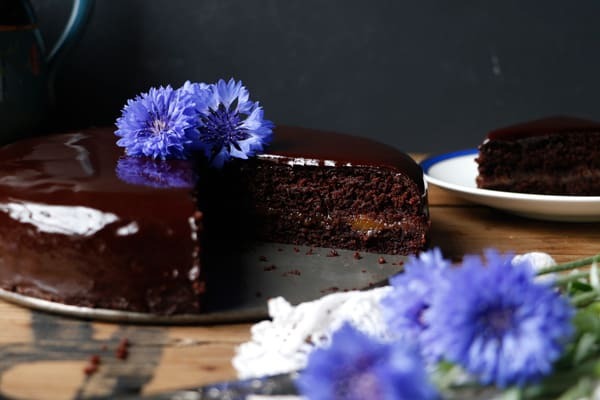 I have kept this recipe as close to an original as possible, replacing the traditional ingredients with wholesome gluten-free and vegan ones and as always reducing the amount of sugar. Except my mum’s apricot jam, that one has fair amount of sugar! This is the first time I’ve tried chocolate apricot combination, which I love and I think chocolate apricot tart could be pretty amazing too. 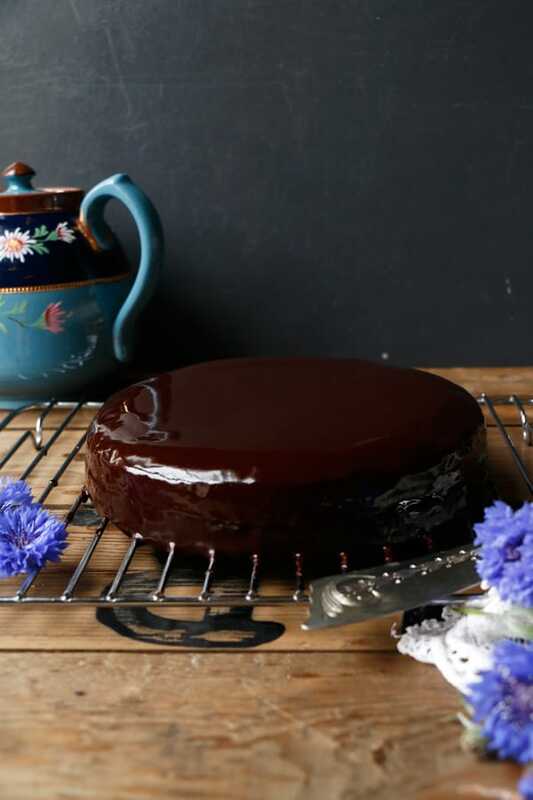 Grease and line 8" round cake spring form baking tin. In a large bowl whisk together brown rice flour, ground sunflower seeds, tapioca flour, sugar, baking powder and bicarbonate of soda. In a small bowl whisk together flax eggs, olive oil, apple cider vinegar and vanilla. Add the wet mix to the dry mix and mix until well combined. Add another 3tbsp of water as needed. Spoon the mixture into the cake tin and level out the surface. Bake for about 30 minutes or until a cocktail stick comes out with just few crumbs left on. 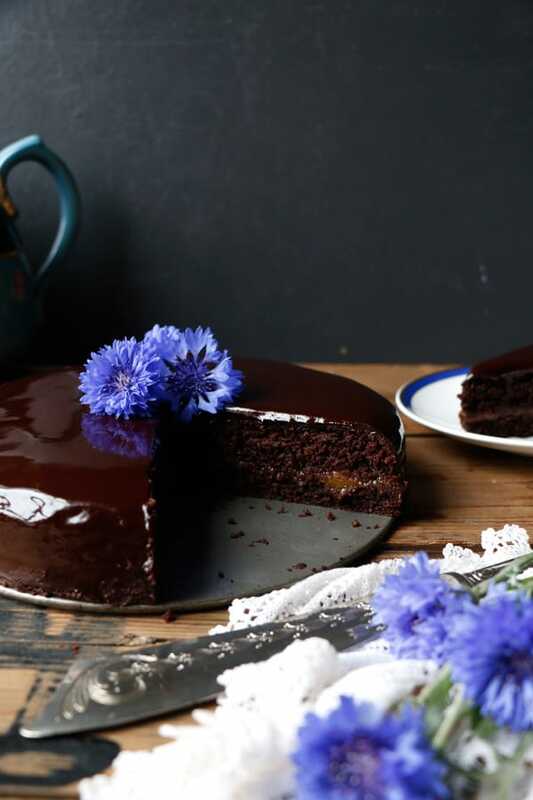 Once the cake is completely cooled, carefully cut in half. When it's very fresh it's more fragile, I use cake lifter to carefully transfer the individual layers. Sandwich with generous amount of apricot jam. If your jam is not smooth consistency, blend it so you can use it to coat the cake. 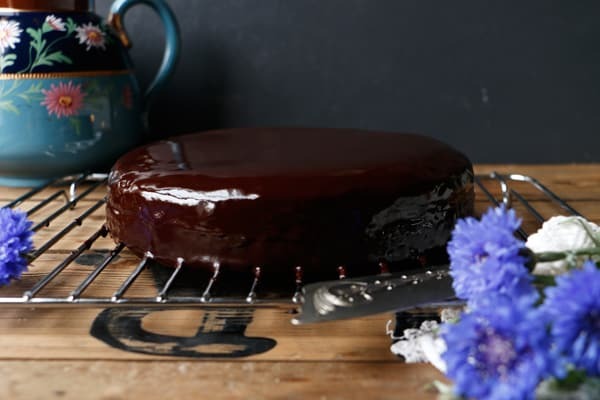 Now use brush or spatula and coat the whole cake with a very thin layer of the jam. Leave to set. Roughly chop the chocolate for coating, place into heatproof bowl with maple syrup and gently melt in a double boiler. Stir until smooth. 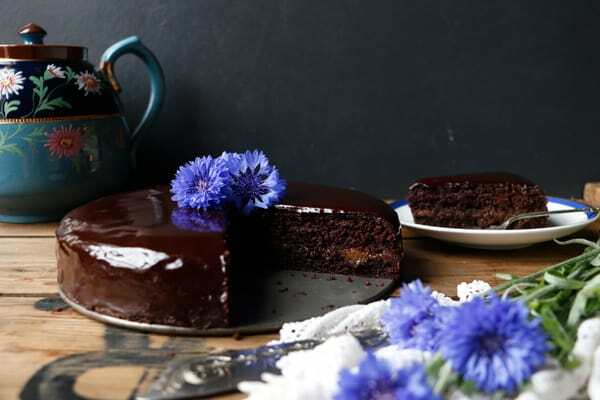 Pour over the cake and use spatula to gently smooth the chocolate over the edge and around the side of the cake. Leave to set and serve. The pictures are stunning! I am not a fan of having jam in the cakes but this one is sooo tempting! Thank you Hana! At first it looked to me like a brownie, but from what I hear the texture is different. I’m curious enough to try for myself now! Hana, this cake is SO tempting! Do you know if coconut sugar will work? Rather than splitting the cake I put the jam on top and then put desiccated coconut on top of this. To cut down on the chocolate I only used 100g but clean forgot to add the sugar. The cake for me was a real hit and I will be doing it this way going forward. I don’t always have tapioca flour in – what can be used as a substitute? I have got to try this! Can I substitute sunflower seeds with something else? Delicious! 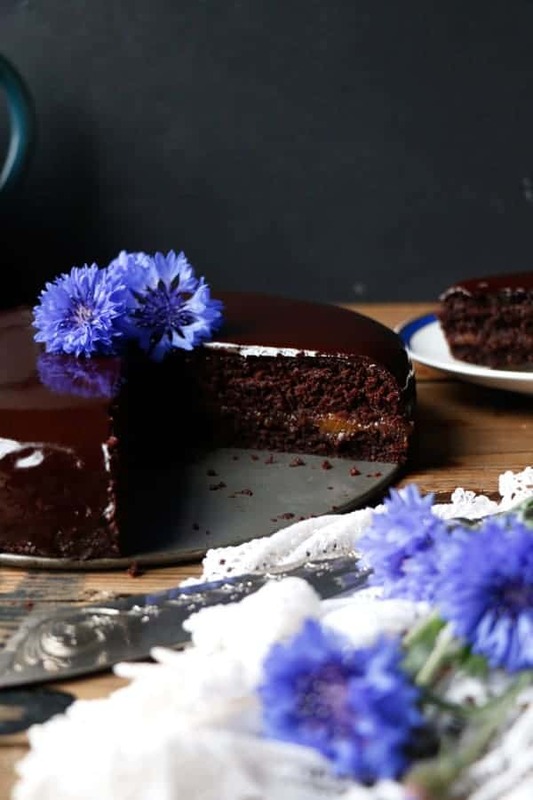 Moist and light and rich. Mine came out very fragile though! I definitely wouldn’t have been able to slice in half. I served it as chocolate pudding instead with a chocolate sauce. Very yummy. 5.In a small bowl whisk together flax eggs, olive oil, apple cider vinegar and vanilla. Hi Robert, it’s the ground flaxseed mixed with water. Sorry if it’s not clear.